Discover archery – through the craft, art and science of primitive skills. We can start with shooting, crafting or both. The core craft is making a long bow, suitable for recreation, competition or serious hunting. Shooting arrows is part of bowmaking, but proficiency is not required. Experience the Wonderful Aspects of Archery Today. Workshops times, classes and demonstrations are scheduled for your convenience. Call to reserve. Kids, youths, adults, families and hunters – all welcome – all fun! Learn why bows work and compare the different materials and shapes. Choose a bow to match your size, strength and crafting level. Crafting can begin anywhere from a U-finish bow to tillering a raw stave. Design and make the right arrows for your bow. Make custom quivers, leather bow grips, tip protectors, string keepers. Braid and serve a Flemish-twist bow string. Enter your archery craft in the local fair. Best of show? – let’s do it. Learn how to set up & adjust your bow & equipment for best arrow flight. Develop traditional field archery styles and intuitive shooting techniques. We have targets at my indoor & outdoor ranges. Certified classes (Junior Olympic Archery Development and Adult Achievement programs) are available year-round for your organization or individual – classes run 8 sessions (60-90 min each), include equipment use and class materials. Certified Instructor Training is available as well – class is 8hrs (in 1 or 2 days). For local and out-of-town groups we can arrange to come to you – where you craft in your shop or we set up portable targets for training in your space. 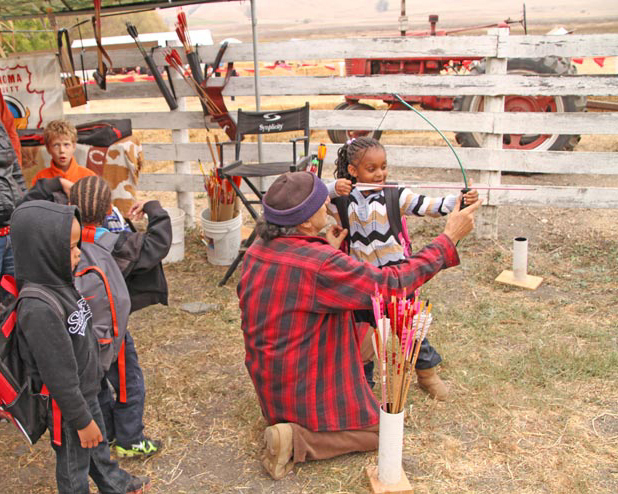 Archery demonstrations and all-ages first-time shooter sessions are available for your outdoor events (pending feasibility and local restrictions) – call for detail and planning. Workshops times, training and demonstrations are scheduled for your convenience.